Orb is an approved provider to North Yorkshire County Council Health & Adult Services, works closely with the Community Mental Health Teams and local GP practices and can accept referrals from all of these though level of support and access to services may vary. If in any doubt, get in touch, we’ll be happy to discuss options. Support is currently charged at £29.07 per half day though some sessions are provided free depending upon funding. Some individuals may be subject to a financial assessment by the local authority. Those paying for their own care or accessing an Individual Budget from Health & Adult Services or elsewhere can also access Orb’s service. Support is currently charged at £29.07 per half day though some sessions are provided free depending upon funding. Please forward a copy of the downloadable General referral form to Orb. All sessions are billed for on a monthly basis in arrears. Orb works with Harrogate & Rural District Clinical Commissioning Group and is accepting referrals from GPs both in Knaresborough and the wider Harrogate District including Ripon. Access to services is limited to free sessions with non-statutory funding. Referral is by standard GP Practice referral letter. Orb welcomes enquiries from individuals looking for support and can support them to seek an appropriate referral. 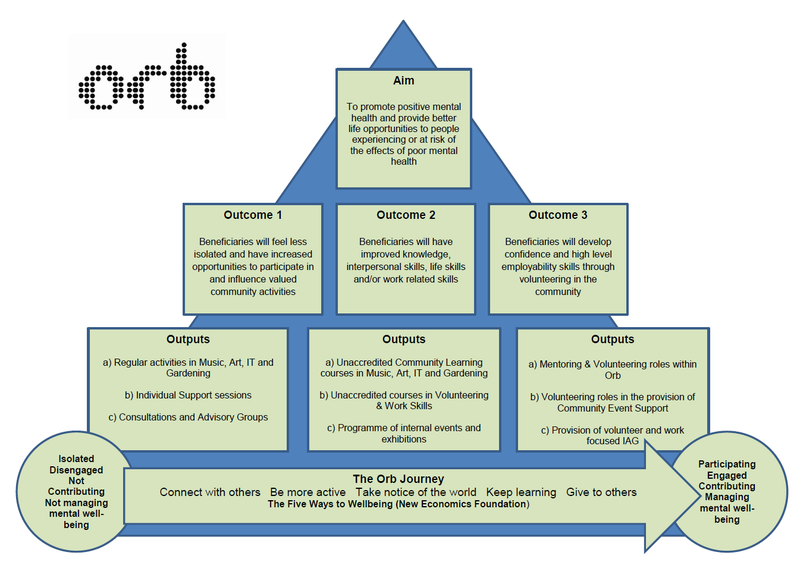 Orb is an Outcomes Focused organisation with a clear Aim, associated Outcomes and related activities designed to deliver better mental health and improved life opportunities for those affected by metal ill-health. This framework is closely aligned to the 5 Ways to Wellbeing, a non-clinical approach to well-being developed by the New Economics Foundation and promoted by national charity Mind and NHS England. The Orb Outcomes Pyramid aims to capture this approach and informs all our work.